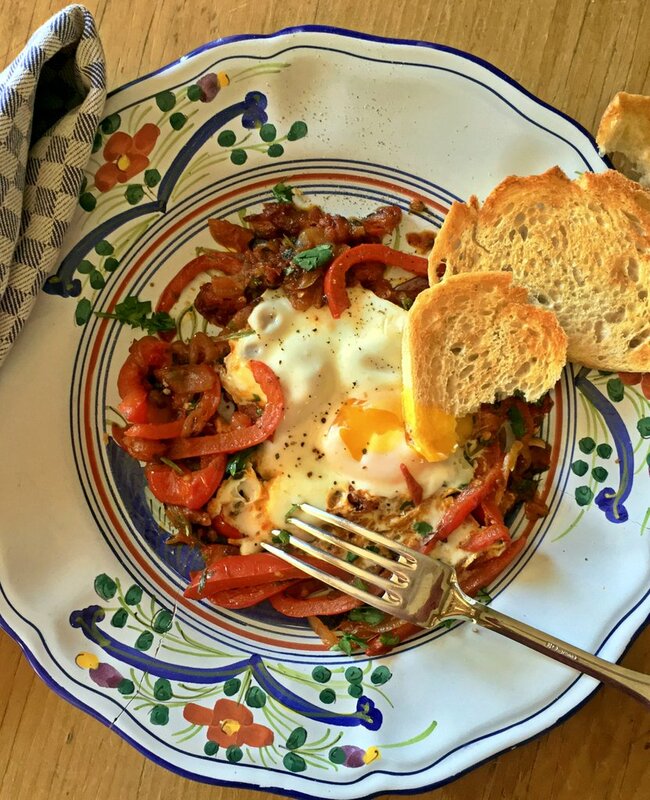 Shakshuka is an “all mixed up” dish of eggs poached or baked in a flavorful pepper and tomato broth. It’s a North African lunch staple now served across the continent, in the Middle East and Israel. You see it made with a range of ingredients such as artichoke hearts, feta cheese, harissa, merguez sausage, diced potatoes and all sorts of herbs. 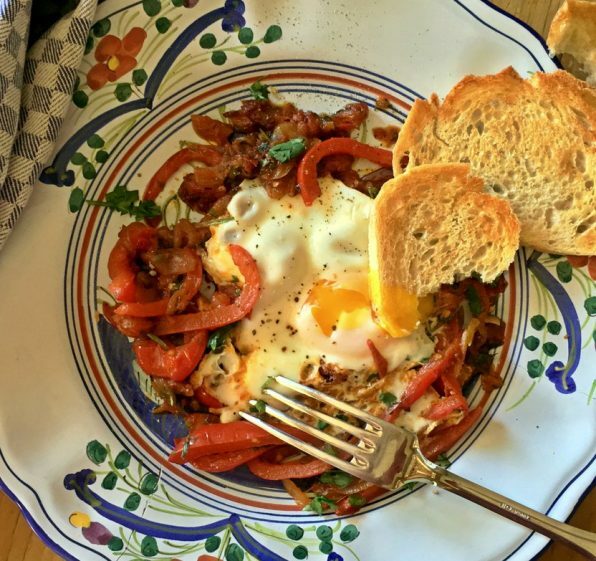 I’ve grown to love shakshuka eggs poached with tomatoes and peppers for breakfast, when I eat it with a hunk of toasted country bread or a whole wheat pita. 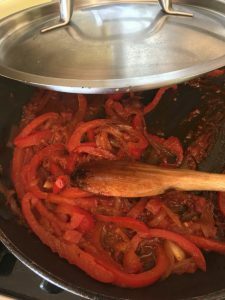 To make shakshuka, you need the pepper and tomato base, which I make ahead in small batches. 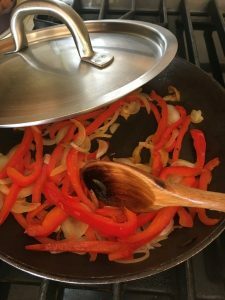 This recipe uses a fresh red Bell pepper but jarred roasted Bell peppers work just as well and require less cooking time. Here the peppers and onions are just beginning to soften. And here is the vegetable mixture after cooking for several minutes. I often add a fresh chopped tomato in addition to the tomato sauce listed in this recipe. Dried Aleppo pepper, a type of mild hot chili pepper from the city in Syria, has the kind of complex taste that makes the dish a touch exotic. (Penzy’s carries it although tragically, it is no longer from Syria.) A quality hot Hungarian paprika is a fine substitute. Eggs simmer or bake in the base depending on what appeals to you; I prefer simmering the dish on the stovetop where I can be sure to have soft cooked eggs. Based on my experience, Tunisians can’t get enough of harissa hot pepper paste. Picture big bowls of steaming hot couscous tinted red from all the harissa added during cooking. You’ll find open bowls of harissa on the table in cafés, like ketchup in a diner here. Moroccan chefs, on the other hand, go light on the harissa, adding it to the broth served alongside plain couscous. Regardless of its uses, harissa is made from hot peppers that are dried over a smoky fire. 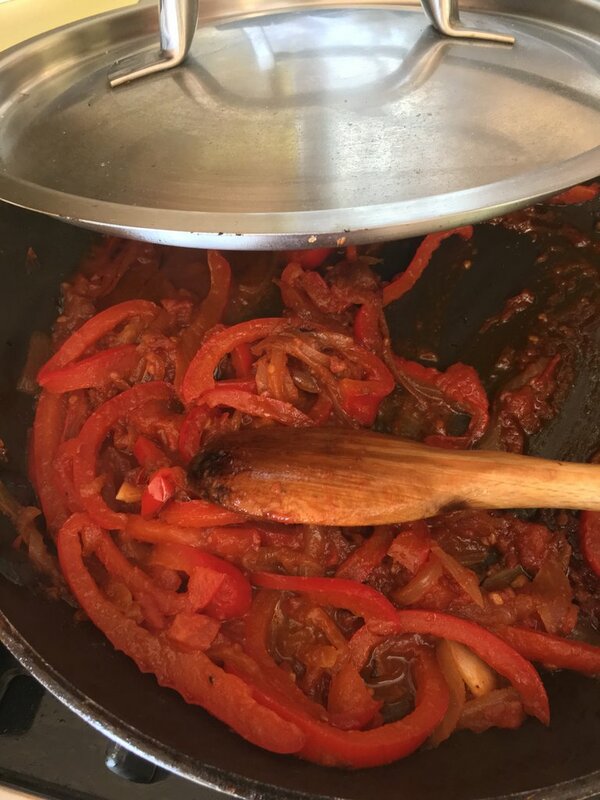 The peppers are moistened and ground with cumin and other spices into a hot funky seasoning paste. Brands that I have seen in the US include Harissa du Cap Bon and French DEA brand, which comes in a tube. That’s my favorite way to buy it. I never use up a can before the paste dries out. I developed this recipe to share with the reader’s of The E List, Erica Tannen’s “Excruciatingly Opinionated Guide to the Connecticut Shoreline.” It’s a weekly electronic newsletter of all that is fun, delicious, healthful and interesting in our area. Everyone who lives here reads it. You should too. Heat a frying pan over medium heat. Add the olive oil, sliced Bell pepper, onion and garlic, stirring for a minute. Cover and cook for 5 minutes stirring from time to time until the peppers soften. Reduce the heat to medium-low and cook for a few more minutes. Stir in the tomato, tomato sauce and water. Cover and cook for 5 to 7 more minutes until the vegetables soften. Add the cumin and hot sweet pepper. Season with salt and black pepper. Cover and let the mixture simmer slowly for 5 to 10 more minutes to bring the flavors together and soften the vegetables. You can cool the mixture at this point and refrigerate for up to three days before using. To make an individual serving of shakshuka, drizzle a small frying pan with some olive oil. Heat over medium high heat. Spoon a quarter or more of the pepper mixture into the pan. Heat for a minute or two. Make a well in the center of the pepper mixture. Crack an egg into it. Cover the pan and cook until the egg is set the way you like it, for about 5 minutes for an over easy egg. Slide the peppers and egg onto a serving plate. Sprinkle with more chopped cilantro and a good grind of black pepper. Serve with toasted country bread and harissa or your favorite hot sauce on the side.